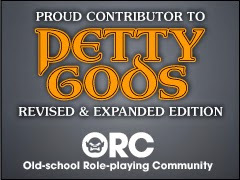 The Other Side blog: All Hail the Prince of Demons! 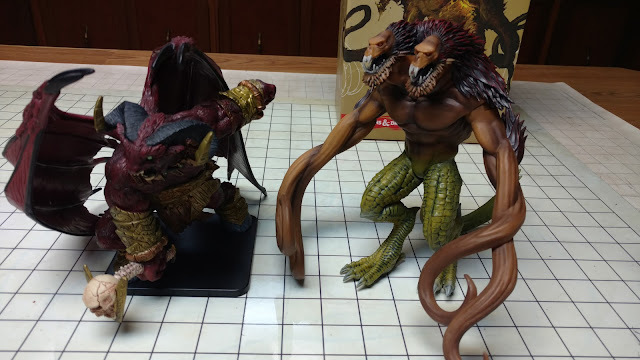 Ever since I first picked up the Monster Manual way back in 79 (or 78, I started playing in 79) there were some names that jumped out at me as an invitation to use them in some way; Orcus, Tiamat, Asmodeus, and Demogorgon. 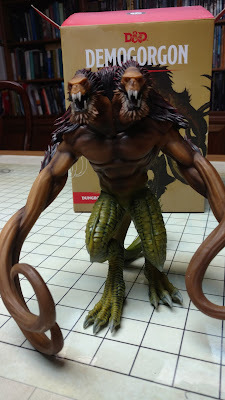 Back when 4e was the new hotness I picked up the Orcus mini. 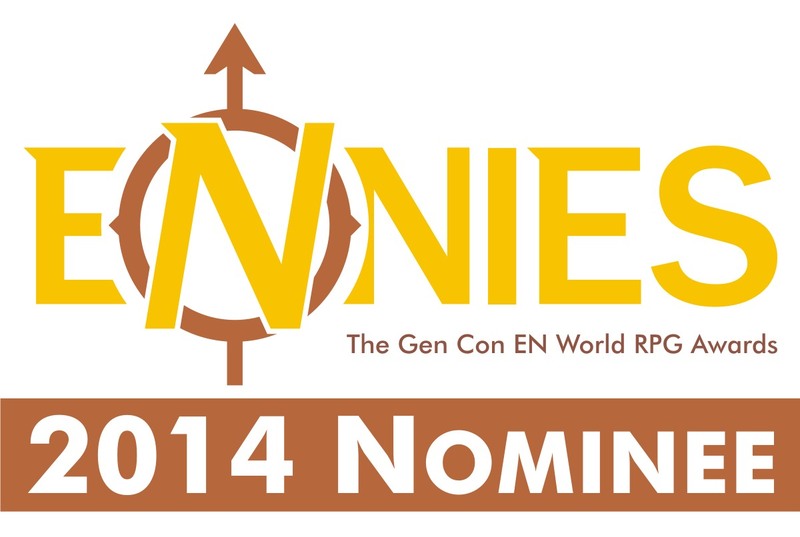 No surprise, he is the bad guy of not one, but two campaign capstone adventures. He is also the "mascot" of both Necromancer Games and Goblinoid Games. So yeah, he is pretty popular. 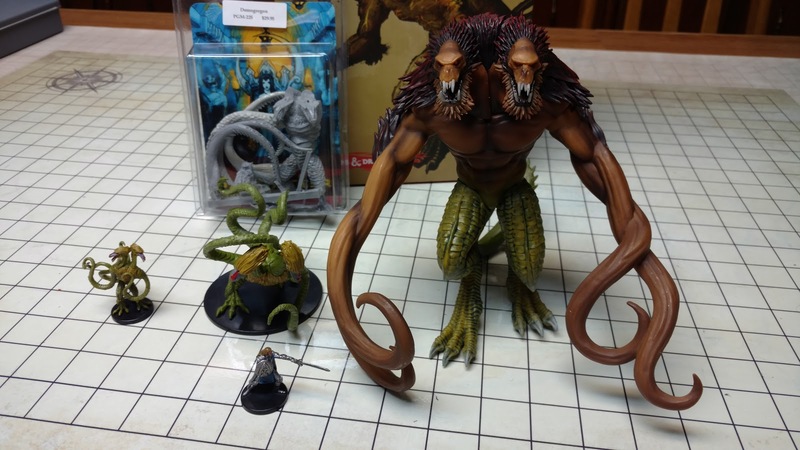 Before that, I picked up the Mage Knight Apocalypse Dragon to stand in for the full Tiamat. Works well. For Asmodeus, I figure just about any devil will do really. He doesn't even really need to be big. I have my Tharizdûn and my Lolth. What I didn't have was a good Demogorgon. 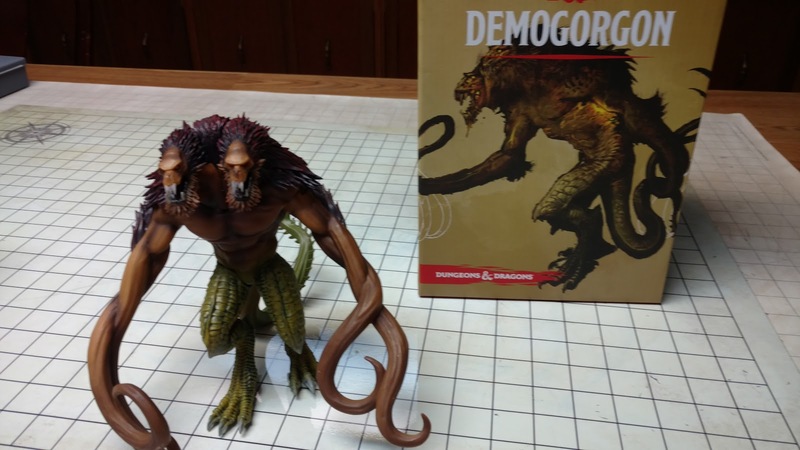 Last year I picked up a Demogorgon last year at AdeptiCon. Earlier this year I grabbed the Classic Creatures Collection from WotC which had two Demogorgon figures; a full size and an aspect. I was ok, though I wished all of them were bigger. THEN I discovered the Loot Crate DX Demogorgon. Well, I wished I hadn't because I became obsessed with finding one. Finally, this weekend my quest ended. As you see he compares nicely to 4e Gargantuan Orcus. He compares even better to his smaller "aspects". That is my demon-hunter paladin there. I hope he is ready! None are exactly the same and that is a good thing. Demons, especially this demon, should have shifting forms. Right now I have him hidden. 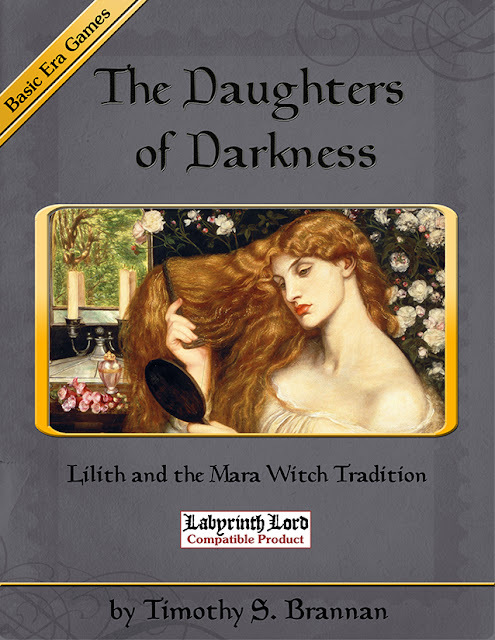 My kids know all about the older Demogorgons (and Orcus and Tiamat), but this one will be a surprise. My wife saw it too and I told her what I was doing and she is very excited. I can't wait to pull this bad boy out! Now I all I need is a good Graz'zt mini.